Perplexed homeowners posted a dilemma on the blog. 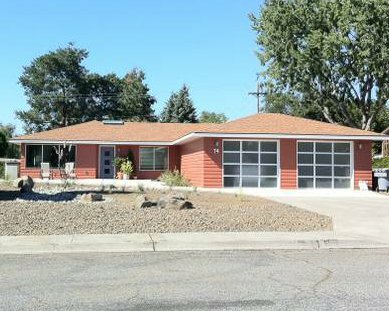 After deciding to keep the Desert Tan roof and aluminum windows on their newly remodeled 1960s atomic ranch, they struggled to come up with colors for the siding, trim and front door. Making matters a little more complicated, they panicked (well, you know) when they saw the newly installed aluminum and glass garage doors they had selected and felt they overpowered the house. Knowing the homeowners did not really like their roof (chosen by previous owners), I offered a couple of paint color options that would coordinate the siding with the roof. 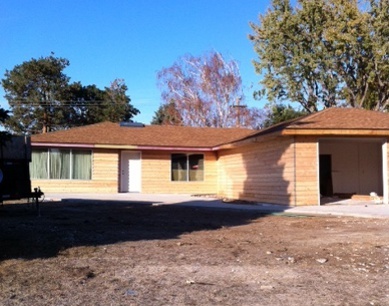 Contrasting the siding color with the roof would have made the roof pop off the house– not something the homeowners wanted. (When you’re trying to camouflage something, think blending.) I gave them Mayflower Red (Benjamin Moore HC-49) and Maryville Brown HC-75. or Amethyst Shadow 1441? They went with the Amethyst. I don’t think you’ll see another house just like this one, and that, in the world of curb appeal, is refreshing! very creative solution. warm colors. We need to make a decision ASAP as the work is starting in a couple of days. Below is a link to a photo of our house. Please help! I love a blue roof on a white house. There are so few colors where a blue roof can work well — white is one of them. And in your coastal location, it’s really quite perfect. Keep all white trim (windows, fascia, door trim). And consider a Gentleman’s Gray shutter color (2062-20 Ben Moore). Dinner party AF-300 (Ben Moore) or Traditional Yellow (Ben Moore 170). I think you’re good to go. You can keep the black metal or move to another metal color like bronze or pewter. You are currently reading Before and After Ranch Re-do: Working with the Roof Color at Your Home & Color Coach.